Holiday from hell, and a glorious Salut! milestone - Salut! Cripes, there was a short cut! With the unwitting help of Sir Richard Branson, Salut! is taking a holiday, its first for rather a long time. 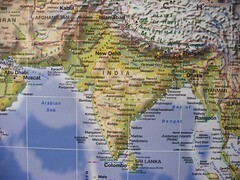 The destination is northern India, with a few days in Nepal at the end. But it is fair to say the itinerary - Abu Dhabi-London-India-London-Abu Dhabi – did not spring from the pages of the Kelly Scott guide to good travel planning. Observant readers may recall that in her role as newsdesk secretary, serving a dozen or more Telegraph news editors, Kelly was generally regarded as the person really in charge of the place. Needless to say, these professional failings were quickly spotted by the new mob, who promptly fired her for being, in the words of her share of the spoof page prepared in honour of assorted departing souls, "far too efficient for far too long". There were a couple of reasons for the route choices I made, or rather neglected to alter, but they are not convincing enough ones to repeat here. While I am away, I expect the total number of hits at Salut! to get very close to, if not sail past, the 100,000 mark. This figures reveals a gratifying level of support and loyalty, and I am especially pleased to note the increasing number of countries from which the visits are coming. Broadly speaking, everyone is thanked for taking an interest. Please use the Comments field to discuss anything decent that takes your fancy in my absence. Salut! tends not to attract huge numbers of responses – crikey, they sometimes dip as low as at the Telegraph blogs – but if this should change over the next couple of weeks, I will come up with some kind of prize for the best Comment posted. The best, that is to say, in my honest opinion. Meanwhile, I should knock off a quick memo to Sir Richard and Virgin, who between them have the duty of looking after my comfort – if comfort is an option in the sort of air travel I do – on the toughest part of my crazy route. I fly with them from London to Delhi two days after touching down at Heathrow from Abu Dhabi. Back as soon as possible, but probably not before I've triumphed over hellish organisation to enjoy a heavenly holiday.